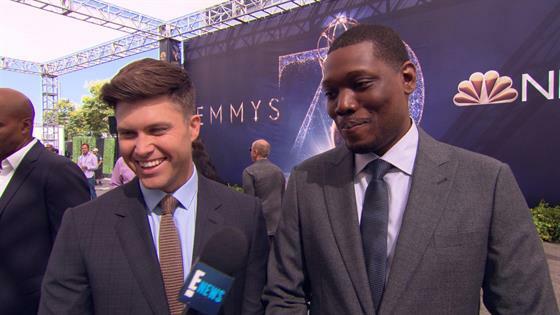 Michael Che & Colin Jost Wanted to Pass Out What at Emmys? Television's biggest night is right around the corner! Awards season kicks off with a major bang thanks to the 2018 Emmys, which takes place live in Los Angeles on Monday evening. The 70th Annual Emmy Awards promises to bring together your favorite stars on the small screen in celebration of the performances that made us laugh, cry and binge watch season after season. Ahead of the highly-anticipated spectacle, we're breaking down all the basics you'll need to guarantee a one-of-a-kind viewing experience. Without further ado... lights, camera, 2018 Emmys! Live from Saturday Night, it's Colin Jost and Michael Che. The "Weekend Update" duo from SNL is sure to bring their signature wit and candor to the stage. For its 11th consecutive year, the star-studded ceremony will take place inside the Microsoft Theater at L.A. Live. When do the Emmys start? Gather your viewing party on Monday, September 17 for E! 's Countdown to the Red Carpet show at 4:30 p.m. ET/1:30 p.m. PT, followed by Live From the Red Carpet: The 2018 Emmy Awards at 6 p.m. ET/3 p.m. PT. The 2018 Emmys telecast airs at 8 p.m. ET/5 p.m. PT on NBC. How do you watch the Emmys online? Head on over to NBC.com or download the NBC app to watch the live telecast on your computer or smart device. Who are the Emmys nominees? Check out the complete list of nominations here! Netflix leads the pack with an impressive 112 nods, followed by HBO with 108. Game of Thrones is up for an Emmy in 22 different categories, while Saturday Night Live, Westworld and The Handmaid's Tale trail close behind. Who is presenting at the Emmys? Drumroll please... Jimmy Kimmel, Sarah Paulson, Issa Rae, Patricia Arquette, Angela Bassett, Eric Bana, Samantha Bee, Connie Britton, RuPaul Charles, the cast of Queer Eye, Claire Foy, Elisabeth Moss and Ben Stillerare among the A-listers expected to grace the stage. Members of the Television Academy select nominees for the major shows categories. For more performance and other individual categories, only peers are able to submit their ballots. Tune in to E! 's Live From the Red Carpet: The 2018 Emmy Awards at 8 a.m. and 5 p.m. in Australia.